If you want free publicity for your blog (and who wouldn’t? ), check out OpTempo’s self-interview form. Just fill out the questionnaire and, subject to approval, the interview about your blog will appear on OpTempo. Once upon a time, free blog reviews also were available but those are no longer offered. If you look at previous reviews, however, you’ll see that OpTempo owner Frank Carr took the review process seriously and did a thorough job. You might want to look through some of the recommendations he made to see if any apply to your blog. UPDATE (courtesy of Y.S. of My MD Journey): OpTempo also offers free 125×125 ads to bloggers. If you want to get motivated to use your blog for selling, let these sales motivation quotes inspire you! Promote your blog by getting it listed in the human-reviewed Blog Collection. When you join, all subsequent members will include your URL in their blogrolls.Â To apply, go to The Blog Collection. It’s not enough to have your site or blog to rank well; it has to place highly for words that are closely related to your Web site or blog content. This is where an important part of search engine optimization comes in: keyword analysis, the art and science of identifying keywords that describe the focus of your Web property and are popular with the public. People who overlook this critical element usually have sites or blogs that don’t rank in search engines at all. If they do rank, they frequently do so for keywords that no one is looking for. For example, if a broker sells condos in the Buford suburb of Northeast Atlanta and her Web site is “GreatSouthernCondos.com,” the search engines probably would rank the site well for the search term “great southern condos.” This is because those words are in her site name and there is very little competition for that exact phrase. But that wouldn’t help her much, because it’s doubtful anyone would search for those exact words. A Web site that ranks highly for search terms that no one is looking for might as well be invisible. To allow the largest number of people to find her site, the agent’s keywords must be specific. She could try using the search term “Atlanta Georgia Real Estate,” which is somewhat specific and has an average of 130,000 people, per engine, searching for that phrase every month. But a search for “Atlanta Georgia Real Estate” in a major search engine also reveals that over five million sites are competing with hers. This is why good keyword analysis is important. People clamor to learn how to make money online, but most fail because they don’t understand that it’s essential to find search terms that accurately describe their businesses, are frequently searched by the public and don’t have too many competing Web sites. For example, if you found a keyword that had several thousand or more people searching for it, and the competing Web sites numbered two million or less, your site probably would rank very well. This is not to say that your site wouldn’t rank well if the number of competing Web sites were greater than two million; in fact it’s quite possible. But to do so, your site would have to have all aspects of Web optimization executed perfectly. Since the number of key phrases anyone can use on a site before diluting their effectiveness in the search engines is limited, it’s critical to focus on words that give you the most impact. But here’s where it gets confusing: even search terms that are quite specific to your business can be duds. You might think featuring the phrases “Buford Georgia real estate” or “Buford Georgia condos” on “GreatSouthernCondos.com” would help the site rank highly when people search for condos in Buford. But you’d probably be surprised to know that virtually no one is searching for either of those terms. So, although it’s important to be specific with your keywords so you differentiate your site, again, if no one is actually searching for the terms you have on your site, it still won’t be found. To analyze your keywords, you’ll need two tools: a keyword finder program, such as Wordtracker, and any major search engine. (Click here for a list of the major search engines.) Wordtracker will display which keywords are being searched for most frequently. As discussed above, without this information, everything you assume about what people are looking for would be a guess at best. Once you’ve found keywords that are both relevant to your site and have a significant number of people searching for them, you can use the search engine to find out how many sites are competing with yours. Simply enter the final keywords you’ve chosen into the engine, one word or phrase at a time, to see how many sites come up under each term. Think about the elements that differentiate you from competitors. If you sell real estate, do you specialize in mountain-view, resort or historical properties, or even all three? If you’re a mortgage broker, do you specialize in hard-to-fund loans? If you’re an appraiser or a home inspector, do you have areas of specialization? You know your business better than anyone, so make a list of any words and phrases that might indicate how your business differs from others in your category. Although the keyword analyst is trained to track down the best words for your site, providing many options for him to search can make the results even more powerful. Introduce your keyword analyst to the person promoting your site to the search engines. Usually, one party does both keyword analysis and Web promotion. 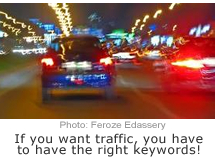 But some Web promoters don’t focus on analyzing keywords. So, if you already have a Web promoter and you hire a separate keyword analyst, make sure the two parties are willing to work together for your benefit. If you haven’t hired a company to optimize and promote your site yet, someone who does both analysis and Web promoting would be a good choice. Whether you do the keyword analysis yourself or hire someone, it should be done. This applies even if you’ve had your site for a long time. Since the search engines renew their listings all the time, it’s never too late to get better rankings. To learn how to avoid some critical mistakes people make when implementing search engine optimization strategies, click here. Article by Dave Schloss, who specializes in keyword analysis and Web site promotion, and is the founder of Super Web Site Promotion.